If you’ve not done so already, you need to create a free account at budget-planner.co.uk. Once registered the first task is to configure your balance and currency settings. 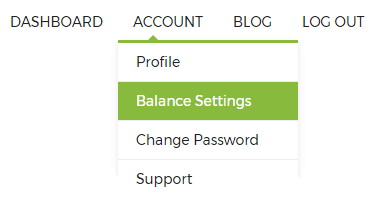 To do this select ‘Account’ > ‘Balance Settings’ from the main menu. Choose the currency you would like to use. Enter the last confirmed balance of your bank account. Enter the date at which this was confirmed. Choose a default start date. This is typically the date when you receive your main income. Once you’ve completed these 4 settings click the ‘Update’ button. You’re now ready to start recording your finances! Start by recording all your incomes. 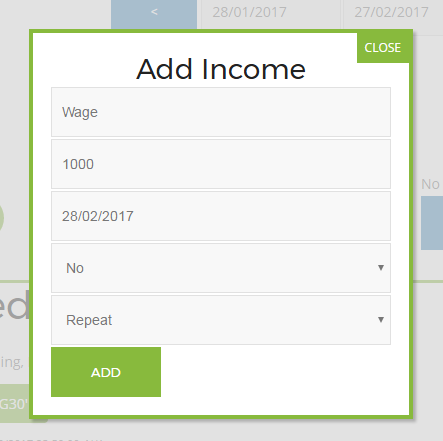 To do this click the green circle with the ‘+’ sign under in the income section. A window will open on the page. 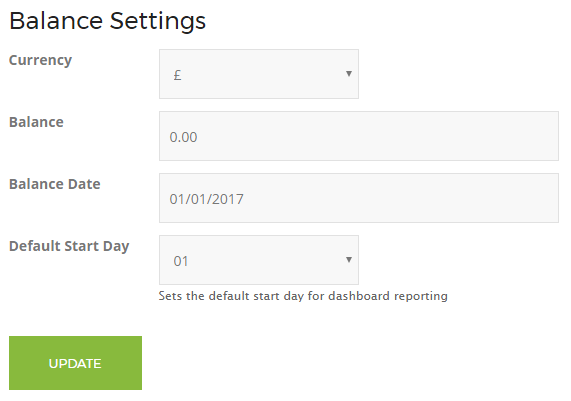 Enter a description such as Wage, Pension, Child Benefit etc… then enter the amount, the date you will receive it (If you have already received the income enter ‘Yes’ in the paid field or ‘No’ if it has not yet been received) and finally choose whether to set this income as a one-off income or a repeat income. Repeat incomes will reoccur each month on the same day as the original entry. Using the example above, the Wage income will show on the 28th of each month. Now repeat this this process for each of your incomes if you have more. Next you need to record all your regular outgoings. The good news is, it’s exactly the same process as entering an income. Click the green circle with the ‘+’ sign under the Outgoings section. Enter a description, the amount, the date it is due to be paid, whether it has already been paid or not and whether it is a one-off or a regular payment. Examples of regular outgoings you should record here are your mortgage/rent, utility bills, phone bills, gym memberships, regular savings and insurance payments. The final section is for recording your Spends. These are your unplanned or irregular spendings and any spendings that don’t have a set amount. Once you have entered your incomes and outgoings you will see a value in brackets next to the Spends title. This is your disposable income, the amount you have left to spend after regular payments. Examples of the types of spends you should record here are atm cash withdrawals, petrol/diesel costs, clothing, lunches and your weekly food shop. Although some of these examples such as petrol and weekly food shops are regular spends, it can be difficult to predict the exact amount you will spend. 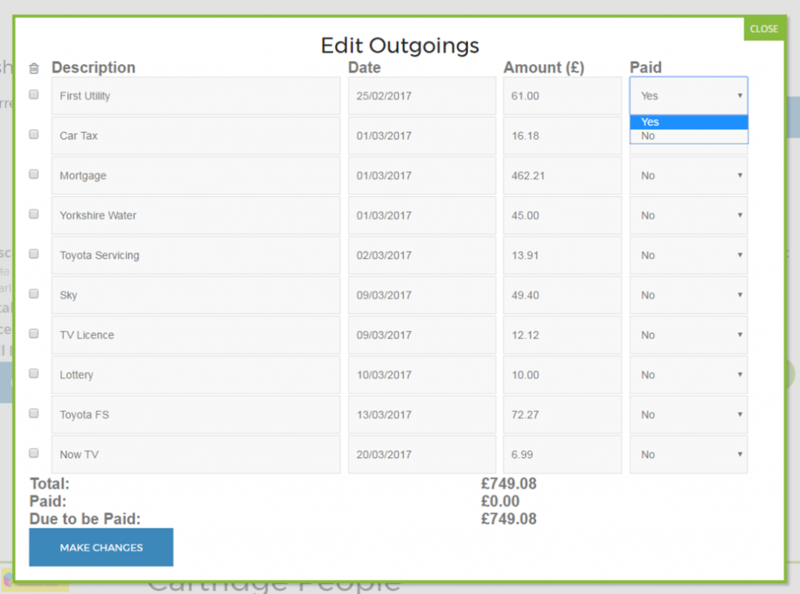 If you prefer to set a budget for these types of spends you can setup a regular outgoing for your predicted monthly spend and then record each instance as a spend and subtract that amount from the predicted budget. Once your budget is setup it’s important to keep returning to update your budget and mark when an income or regular outgoing has been received or paid. To do this click on the blue ‘Edit’ box below each section and change the value in the Paid column to ‘Yes’, then click on the blue ‘Make Changes’ button. You can also amend any of your entries here as well. Use the ‘Current Balance’ value to sense check against your own bank balance. These should match at all times. The only time they shouldn’t is when you record a spend that has not yet shown up in your bank account. If your balance and bank account don’t match you need to check each of your transactions to see if you’ve missed one or entered the amount incorrectly. The remaining value under the Spends section is used to check how much money you have left in the current time period. This is a useful feature as unlike just looking at your bank balance it takes into account any future transactions. As you can see, our budget planning tool is very easy to use. If you do have any additional questions though, please contact us.